Till now Sunrisers are having easy opponents to face off, But when met the defending champions, It was not to be… KKR’s top order ensured runs are on the board by the end of 20 overs and bowlers made sure they win the match with a Big margin… It was actually as easy as I have written.. 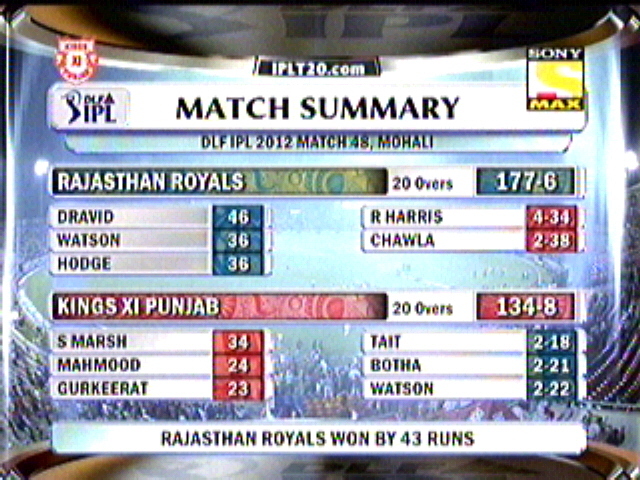 Switching to Jaipur Sawai Mansingh Stadium so called fortress of Royals remained intact even after the game, As Kings XI failed to breach the Wall… A Low Scoring match, as Punjab was bowled out in 18.4 overs for meagre 124 runs, which gave Royals enough time to chase through even after a blistering start from Watson, Royals kept the hunt alive till 19.2 overs and finally crossed the line to get themselves to 3rd place in the table. – Gambhir won the toss four times in Eden and all the times he decided to Bat first and more importantly all the games are been won by KKR. – Gambhir has scored 18 fifties which is highest by any player now. – Gambhir has now 14 bowled times, which equals second highest with Dravid & Sangakarra. List is topped by Kallis with 15 to his name. – 22 runs conceded by Thisara Perara in his last over, is also the highest ever conceded by him in any T20 internationals. – 71 runs scored between 15 to 20 overs by KKR is the highest ever for them in Eden gardens. – With a six of Narine today, Thisara Perara is among the 11 others who have scored a six against Sunil Narine’s Bowling. Added fact Suresh Raina is the only Batsmen to hit Narine for 2 sixes. – KKR’s victory margin of 48 runs is the highest for them in Eden gardens, bettering 47 runs victory Vs RCB in last season. – 48 runs victory is also the highest for this season in terms of runs margin, bettering Mumbai Indians 44 runs victory against Delhi. – David Hussey scored his 50th six of his IPL career. – Sreesanth bowled the 6th Maiden of this season and his 3rd in his IPL career which has 137 overs to it. – With Ajit Chandila opening the bowling today, RR have opened the bowling attack with spin 33 times in their IPL Career. – Gilchrist recorded his 7th IPL duck, which the second highest now, List is topped by Manish Pandey & Amit Mishra sharing 8 ducks. – This is 6th time Sreesanth has picked 2 or more wickets in an over. – When Dravid out for 9 runs today, It was only the 7th time he is out on a Single digit in 32 games for Royals. 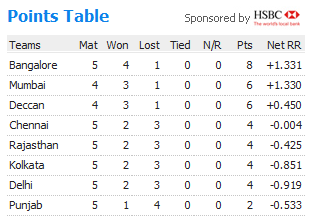 – Sixless innings from Rajasthan Royals to going through the victory is the 4th time in IPL season. 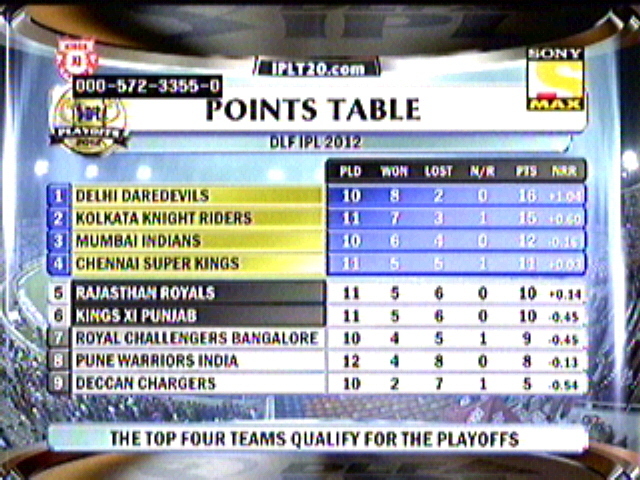 – KXIP are yet to win a match in Jaipur against Rajasthan Royals. Full Aussie flavoured Match as, Two Aussie veterans face each other, Warne won the coin from Gilly and decided to chase, which has been a trend in IPL in this season so far. Nothing much to do by Warnie bowler, as they were massacred by KXIP batsmen and RR bowlers picked two wickets in two no balls, and both of the openers. In simple nothing went right and its de day for Preity to be all smiles and dimple, which see was able to keep it all de day till the end, As KXIP won the match by 48 runs. – KXIP scored their first fifty runs in just 2.5 overs, which is the fastest ever in the IPL history, and i think its gonna be as long as IPL stays. – Shaun Tait bowled the fifth Maiden of IPL 4. – Shane warne picked up his 50th IPL wicket and its Paul Valhathy. – Sid Trivedi figures 4-0-59-0 is the worst bowling figures tied down with RP singh. 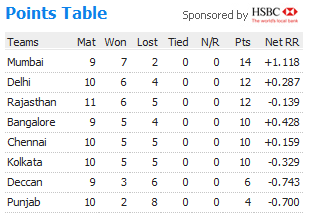 – 195/7 is the highest score by any team this season , previous was also by KXIP 193/5 vs CSK. – Sunny Singh scored the 600th Boundary of IPL 4. – Both Tait and Trivedi picked the wickets of Gilchrist and Valhathy in the first and second over respectively, but to see them continue to smash them all over the park, because they both did overstep on both the occasions, which is also the first instance in this season of IPL. – Shaun March scored the first fifty of this season and his 8th one overall in IPL. After their last win Kings XI will be confident to pull one more, But on the other side u have a Magician who keeps on pulling rabbits out of the hat, (esp the la(o)st one against DC’). Another big plus for Royals is they play in their Fortress home ground, where they have a formidable record of winning games. In simple its like winning a marathon without legs for the opponents. KXIP 153/6 in 20 overs. RR 157/1 in 15 overs. RR WON THE MATCH BY 9 WICKETS. All those who have seen the chase will say one word, MASSACRE. Michael Lumb just had one idea in his mind, its to make ball see the fence. And he kept doing it atleast twice r thrice an over. Well aided by worst bowling from KXIP. Just one man show as Lumb stole all the honors for the day, Naman Ojha and Yusuf just added icing in the cake to finish off the things in three quarter overs. One thing will make Sangakarra happy is that, he ll not be penalised for slow over rate, LOL… In end RR outclassed KXIP and send them an official note of exit in IPL 3. Another Must win game here., this time for KKR’s. Dada infront of his home crowd won the toss and decided to Bat first, Two Big G’s (Gayle and Ganguly) got Kolkata to one of their best start, first ten overs went wicket less, and KKR had scored 88 runs in the process. Gayle was the first one to depart as he tried for the second six of Rajat bhatia and missing it completely, Later in the over Ganguly completed his 50 with a huge cheer from the crowd. But couldn’t build just like the last time as he gone to a lovely slower one from vettori. McCullum mistimed a run and ran himself out in short time, Matthews and Tiwary carried the rest of the innings with late power from them got KKR past 180 runs. KKR 181/3 in 20 overs. DD 167/8 in 20 overs. 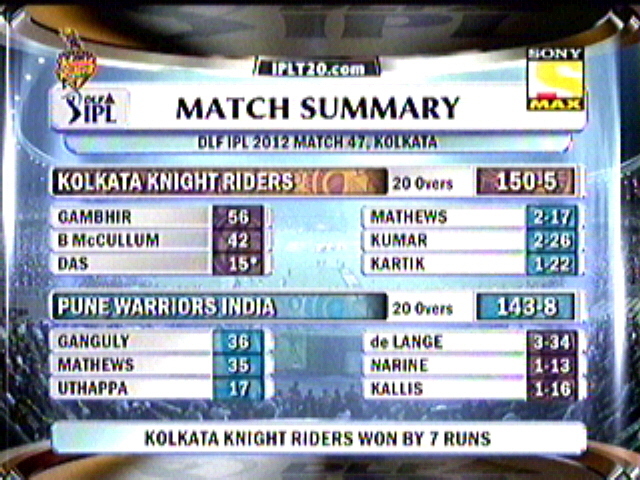 KKR WON THE MATCH BY 14 RUNS. One win to inch closer for Delhi, without doubt they will fancy to take this down, Ashok Dinda started with fire as his first over kept troubling Warner finally getting him see his timber rolling back. From then on joined later skipper Shewag and current skipper Gambhir to steady the things, with these Indian openers in crease any target is achievable, it certainly look though, as they scored 99 runs in between them in the space of 60 balls to bring victory closer, But Gambhir was very much unfortunate when he himself ran out to a direct hit from Dada. (Not surprised 🙂 ) Can say this is the turning point too, as Collingwood failed today to make an impression, Shewag the only hope continued to haunt Ganguly, Dada turned towards his most experienced bowler Agarkar, it did give result in hand as he removed Shewag, this is the time game totally changed upside down, Even though delhi needed just 48 from 32 balls, Ganguly inspired his men and he himself fell down to stop the balls, Bowlers bowled in right length and line, fielding improved all came together for KKR as they closed in a win with 14 runs. Karthik tried his best but not quite enough to get them past. 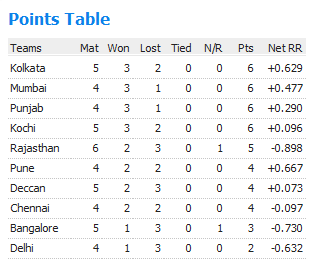 KKR gained very important 2 point, which meant points table now has been opened up for 5 teams to fight for 3 places. Really getting tough now for all… And interesting for viewer who can exercise their maths and stats skills. – Sreesanth(6) has bowled most no balls in IPL so far. – Fifty in 3.5 overs is the fastest for an IPL team this season. – Manoaj Tiwary hit the 400th six of IPL 3.
warne for most no.of run outs. – Shewag scored his 7th IPL fifty. – 34 ball fifty is the slowest fity by Shewag out of the other 6 scored previously. – No boundaries were scored in the last five overs, KXIP achieved this unique one. Orange Cap – J.Kallis (425) followed by Sachin Tendulkar (394) and Naman Ojha(352). Purple Cap – Amit Mishra(14) followed Pragyan Ojha(13) and Muralitharan(12). Most Fours – Sachin Tendulkar (58) followed by J.Kallis (52).